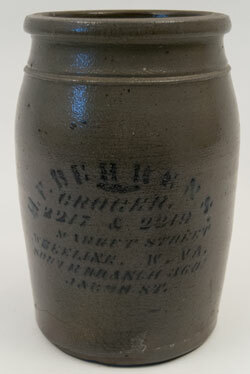 Tanware was manufactured in New Geneva, Pennsylvania from approximately 1880 until just after the turn of the 20th century and was sold mainly to tourists as souvenirs. 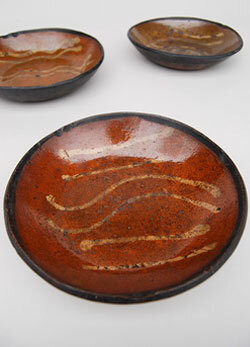 Thus, great care was taken in making beautiful and elaborate hand-painted decoration on these pieces, and this is why Pennsylvania tanware ranks as some of the most highly prized and collectible antique American stoneware. 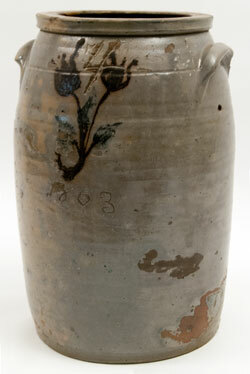 Circa 1830-1850: Measuring 15 1/2" tall and 10 1/2" wide, this rugged 5 gallon Ohio ovoid jug with floral decoration and a neat decorated handle is a sight to behold. 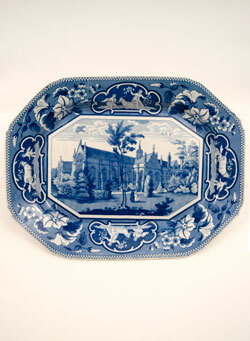 The charming floral decoration approximates the wisteria and counterpoints the masculine beauty of this formidable hunk of early American stoneware. 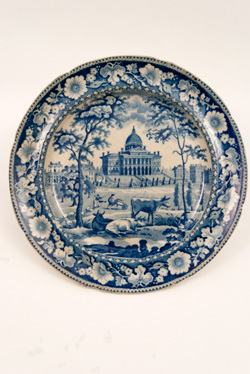 Circa 1825-1828: Enoch Wood &amp; Sons Shell Border with Circular Center— Enoch Wood & Sons produced dark blue historical Staffordshire transferware of American scenes in the two decades following the War of 1812 as a way to rekindle England's trade relationship with the United States. 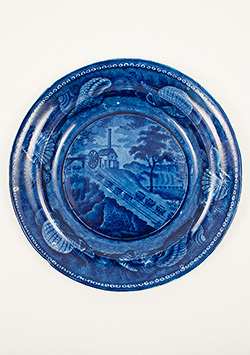 Their shell border with circular center series consists of American and Canadian views, and one of the most desirable scenes in today's market is the B & O Railroad plate with the incline view. 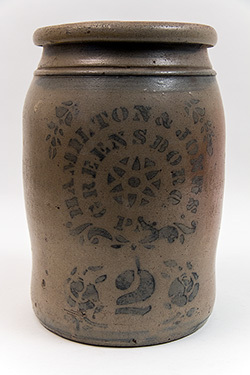 Circa 1838-1846: Standing 11 1/2"in height, this highly ovoid storage jar was maufactured by the storied New York Clark family of potters. This mark was used only for eight years and is fairly scarce on today's market. The crock has one outside rim chip and a couple minor inside dings but has no cracks or repairs and is in excellent condition for a piece of its advanced vintage. The large freehand numeral 2 leaves no mistake of its two gallon capacity and gives the crock a great country primitive appeal. 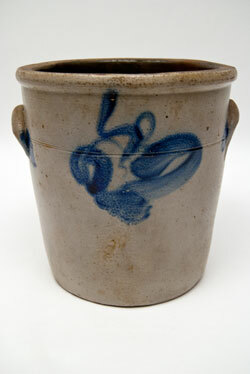 Circa 1880s: Highly prized blue decorated stoneware produced in Morgantown, West Virginia, is hard to come by in any condition, and this handsome, folksy two-gallon storage jar with Morgantown's signature feather decoration has no chips, cracks, or repairs. 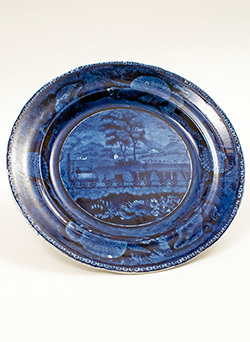 Painted from top to bottom of its field in rich, pure, bold, and confident cobalt strokes, this superb example of antique American folk art pottery has the high blue/gray contrast and striking quantity of cobalt embellishment the discerning stoneware collector desires. 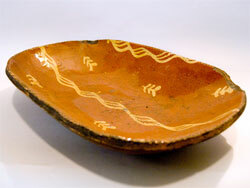 Coggled edges and yellow slip decoration and great wear on this lovely early redware plate. 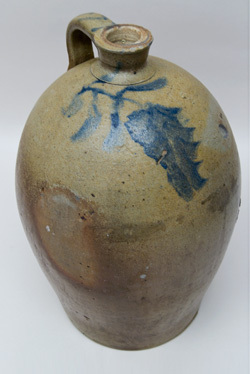 8 1/2"
Circa 1830-1850: Although unsigned, this handsome 10 1/2" tall ovoid blue decorated antique stoneware jug features the tilted floral decoration present on many forms of pottery from Daniel Shenfelder's shop in Reading, Pennsylvania. 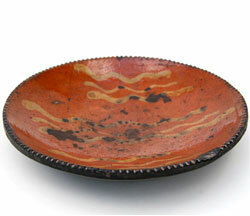 Circa 1850-1880: Excelent condition on this early american antique redware, slip decorated bowl. Six freehand painted yellow slip lines. Circa 1840: Agate or marbled - Also know as variegated designs were made by working several colors of slip together on the ware to give a marbleized, swirled, or spattered surface. 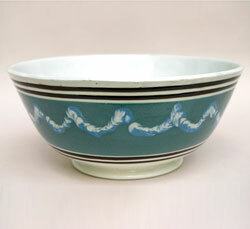 This usually resulted in a busy surface pattern, which was pleasingly balanced with bands of checkering or impressed designs at the rim and foot. 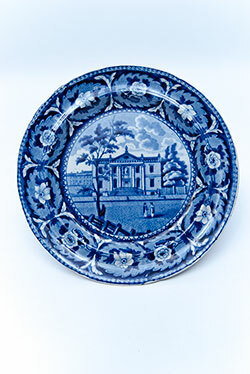 Manufactured in the 1770's, it is the earliest know example of slip on refined earthenware. The process was used to imitate geological stones like marble. 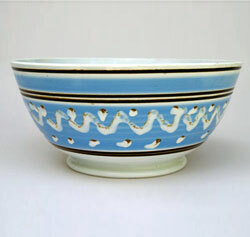 Increased simplicity and uniformity of decoration such as simple banding without additional slip or incised designs marked later dipped wares, generally after 1840. This simplification was a way of cutting the production costs. Circa 1820: Gaudy Dutch pottery, made by the Staffordshire potters for the American market, is bright and colorful and one of the most desirable of the soft paste porcelain wares. 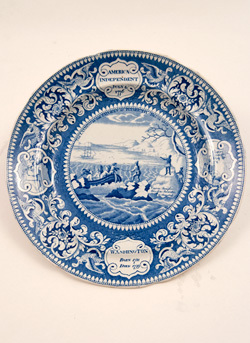 Gaudy Dutch is typically unmarked, which has been attributed by some to be indicative of Americanulls reluctance to buy English-made products after the Revolutionary War. Painted with artisan excellence, all done in freehand, the deep rusty reds and rich cobalt blues are as striking today as they were nearly 200 years ago. 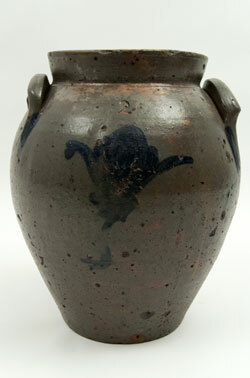 Circa 1880-1900: Unusual Red Clay, Beautiful Form. This handsome half gallon New Geneva, Pennsylvania tanware pitcher displays Lincoln drape decoration. 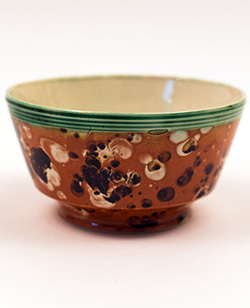 Circa 1850-1875: Great color on this early yellow slip decorated antique redware bowl. 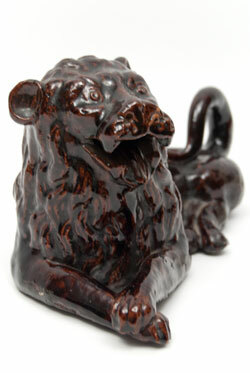 Circa 1900-1925: Measuring just under 10" wide, this whimsical Ohio sewer tile recumbant lion sports crossed front paws, open mouth, and unusually positioned tail. 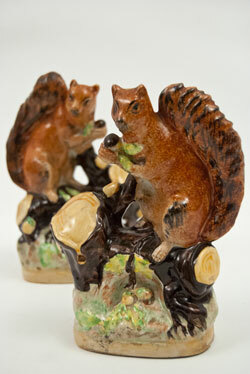 Circa 1870: Pair of hand painted, early Staffordshire Pottery squirrels on stump holding acorns. 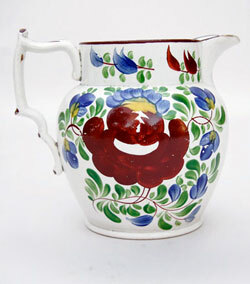 Staffordshire figure pottery body with pearlware glaze and decorated in enamel colours. The figures are very well modelled and have strong visual appeal. 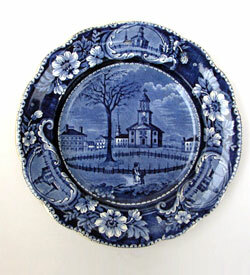 Harvard College: Blue and White Historical Staffordshire Stevenson and Williams oak leaf and acorn border plate. 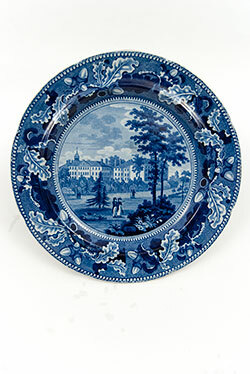 Circa 1826-1834 | James & Ralph Clews. 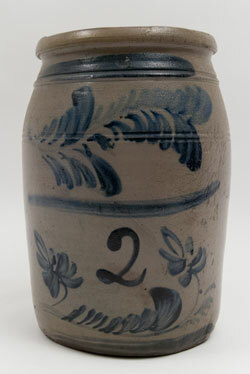 Dated 1863: Note the stamped or more formally done "5" gallon mark overwritten by a large 4. 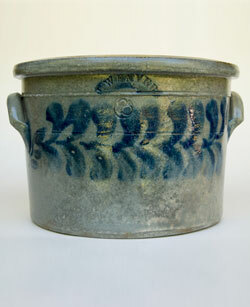 An inscribed "4" was also added to the back of the crock so no mistake would be made on its size. 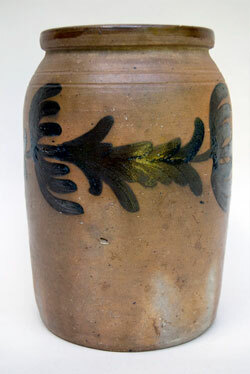 Highly unusual manganese floral decoration and rare Civil War date make this an exceptional piece of antique American stoneware. 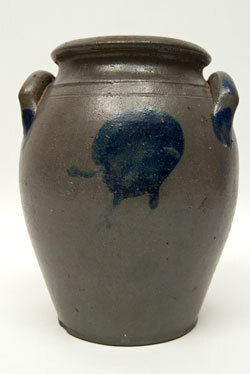 This unusual jar measures 12" Tall, 7" Wide at the top, and 6 1/2" at the bottom. Circa 1870s-1880s: This striking double flower decoration on this folksy two gallon pitcher is classic Peter Hermann, Baltimore, Maryland's premier 19th century potter. 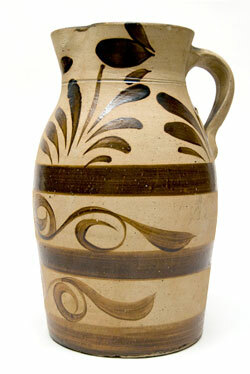 This antique American stoneware pitcher has great lines, is big and bold, is in fantastic condition, and will make a superb addition to any collection of stoneware or early American antiques. Circa 1880s: T.D. 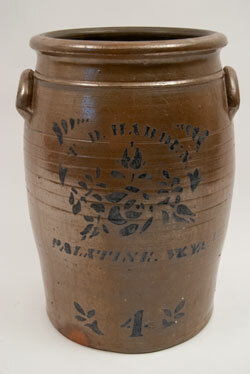 Harden Rare Large Size Storage Jar— West Virginia stoneware collectors love Palatine's T. D. Harden late 1800s cobalt stencil decorated crocks, and this four-gallon storage jar in excellent condition with no damage is a scarcely found, thus very desirable, size. The graceful lines and beautifully colored clay on this formidable example antique American stoneware will make this a centerpiece in any setting of early American antiques, country primitives, or 19th century stoneware and Americana. 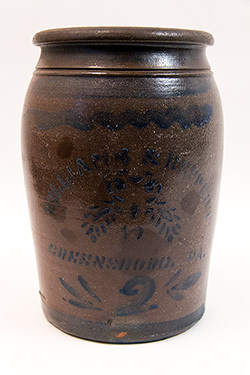 Circa 1880s: West Virginia merchant jars are highly prized in the collecting realms of antique American stoneware, and this 10" tall F. H. Behrens storage jar manufactured for one of Wheeling, West Virginia's leading grocers, surely fits the bill. Circa 1870-1880: Here is a good, clean antique two gallon country primitive stoneware crock with floral decoration and canted sides that is probably of Pennsylvania or Ohio origin. This very reasonably priced piece of 19th century American stoneware will fit nicely in a collection because of its unusual shape. Circa 1830-1850: This wonderfully primitive 10" James River Virginia ovoid jug sports a circle of coblat that is often referred to as moon decoration. 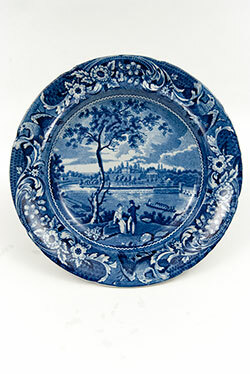 The line on this piece are outstanding, and the cobaly decoration is both unusual and attractive. This is a very nice jar! Circa 1820-1850: It is always exciting to find the antique redware in yellow script decoration with letters, names or other readble parts. 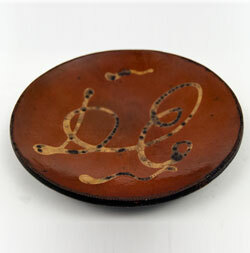 This example of a nice early coggled edge plate boasts the initials "DE" with decorative squiggles flourising across the top and bottom. 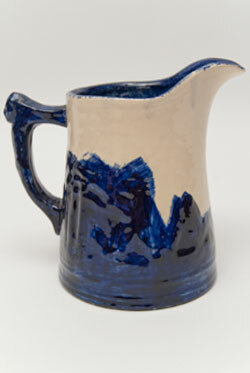 Prufuse and Unusual Decoration: Here is a fabulous tanware pitcher meant for the most advanced and discerning collector. 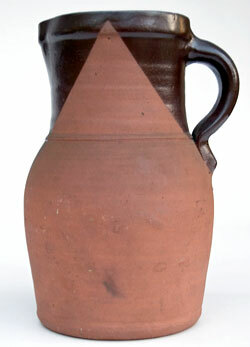 It is quite uncommon to find tanware pitchers that are taller than nine inches and have greater than a one gallon capacity. 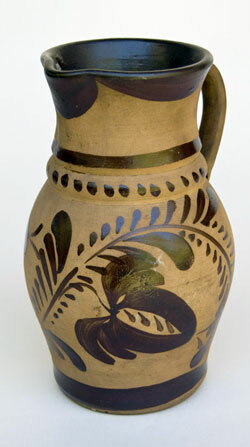 Thrown from the light colored upper river clay of the Monongahela, this one and a half gallon pitcher stands eleven inches in height and features highly unususal decoration which includes three stripes, two rows of swirls and top borders of leaf sprays. 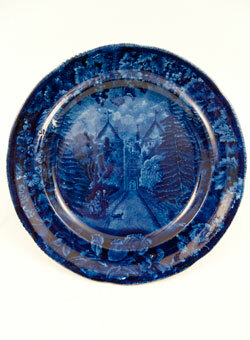 Circa 1870-1880: Possibly Attributed to Galena, Illinois. 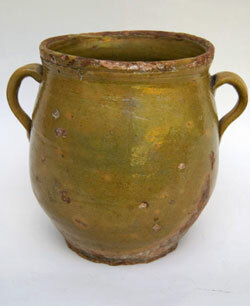 This superb redware storage jar was found in northern Inidiana and shares all the attributes of pottery made in Galena, Illinois. Circa 1860-1900: Without question, A.P. 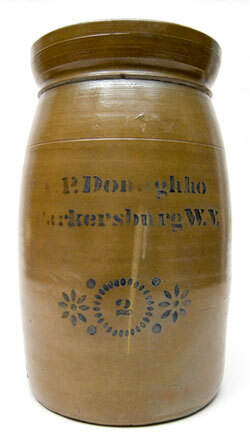 Donaghho is West Virginia's most well-known potter and is among the the finest American potters ever to spin clay on the wheel. 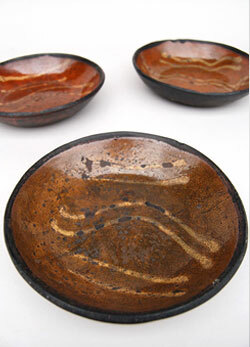 Donaghho was in business for forty years, and in that time, he threw stoneware in a wide variety of forms and decorated his pieces both freehand and in stencils. 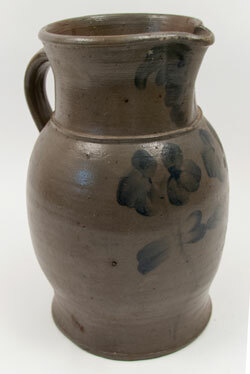 Standing 12 1/2" tall and 7 1/2" wide, this two gallon snowflake churn is a real gem. 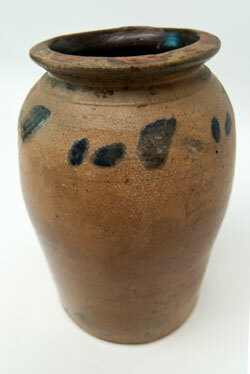 Condition on this churn is outstanding, with no chips, cracks, or repairs. 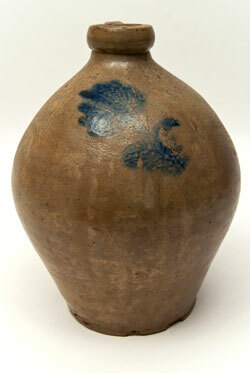 This is a wonderful example of West Virginia stoneware. 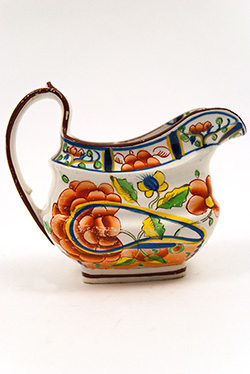 Circa 1810-1820 | Coggled edges and yellow slip decoration and great wear on this lovely early redware trencher.18" x 12"
Excellent condition and superb hand painted decoration make this early soft past pitcher a great find. Extremely Rare 3 Gallon Cake Crock: Beaver County, Pennsylvania stoneware cake crocks are hard to find, and this J. Weaver three gallon cake crock is the largest example we have ever seen from the region. Measuring a remarkable 12 inches wide from handle to handle and nearly 8 inches in height, this highly decorated and signed western Pennsylvania cake crock is a real gem and is worthy of even the finest collection of early American antiques. 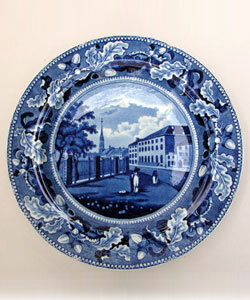 Circa 1905: Wonderful freehand painting and cobalt blue stick spatter decoration on this hand painted rabbitware plate. 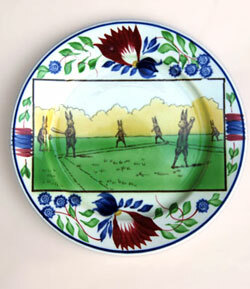 Rabbit sporting scene plates are highly desirable. 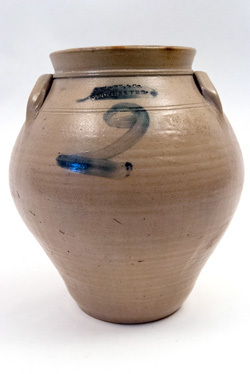 Excellent Freehand Cobalt DecorationThe striking cobalt freehand decoration on this 9 inch Pennsylvania or Maryland half gallon stoneware storage jar has great contrast and stretches completely around the jar. There are no chips or cracks and only one stone ping on this eye-pleasing antique storage jar, which will fit well in a setting of primitive antiques or early Americana. 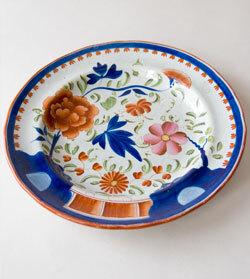 19th Century Pottery in Excellent Condition: Very lovely, early Gaudy Dutch plate with great hand painted decoration in brilliant color.